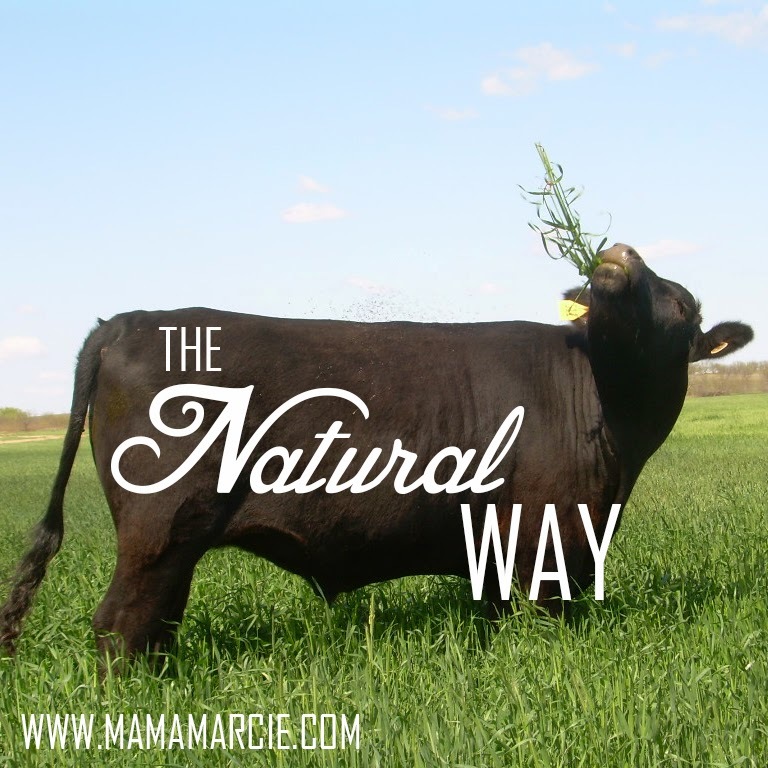 Today I am starting a new series called The Natural Way. Once a week, I will be posting an interview of someone who goes a bit against the grain and chooses the Natural Way to accomplish important tasks. Why did I decide to start this project? I think that the average Joe (or Josephina, haha) thinks that living a more natural life, away from the processed foods, away from relying on someone else for everyday needs, is unattainable. Everyday, I find it increasingly more important to develop sustainable projects in my home, in our family and community. It is sad, but true, that we can not always trust for someone else to make the best decisions for us in our food, in our health, in our homes... we have to do research and dig past the commercialized information and seek out truth. When we choose local, when we choose natural, when we choose REAL, we are making a statement that we CARE about our wellbeing and about our community. That we value these things over financial gain. So, on that note, our first interview is of a long time friend of my family - Lauren Nitschke. Lauren and her husband, Gary, have two kids and lived for much of their lives in Oak Cliff, a small community in Dallas that is on the forefront for the natural living movement. Together, they own and operate a ranch in southern Oklahoma, where they now reside. Their ranch is 100% grass fed and grass finished. These are happy, healthy cows who are treated with respect and integrity. What the Nitschke's are doing is a difficult task, but they do it nonetheless. I wanted to take a moment and showcase their hard work, and at the same time, help us readers to understand a little more about why what we eat is so important. Q: Hi, Lauren! Can you introduce yourself? Tell us a little about who you are. A: Hi! I've been married to fellow Aggie Environmental Design grad Gary Nitschke for 34 years. We lived almost every bit of that in 2 1920s houses in North Oak Cliff - one in Winnetka Heights (that should have been a tear-down when we brazenly declared ourselves to be the new breed of Urban Pioneers) and the other on N. Tyler (which was a good tear-down candidate as well, come to think of it..) So we developed a habit of choosing the underdog early on, as well as a propensity to see the potential in not so great looking properties. Both renovations were gut to the studs and rebuilds, but they both were successful in their own right. If you take that mindset into the ranching world, the translation becomes take a piece of somewhat neglected family owned southern Oklahoma rangeland (at the time - Gary's dad had become elderly, then passed on in 2003), pick the most challenging way possible to manage it (chemical-free grass fed/finishing only), endure a once in a lifetime, epic drought, and still maintain a great client relationship with Whole Foods, that's us. Good stewardship is a hallmark of our Christian faith and always figures into our ranch decision making. We have 2 wonderful grown kids, the best son-in-law we could have ever hoped for and the cutest, smartest, almost 3 year old grandson. So far, no ranching aspirations among the offspring, but we have high hopes for grandson! Q: You and Gary haven't always been ranchers. What did you do before you dove in to this lifestyle? A: I'm a Dallas girl, born in Austin, so city dwelling is in my blood. After finishing up at A&M, we both worked for architectural firms in Dallas that specialized in commercial work. I had an opportunity to transition to my firm's Environmental Graphics "department" (there were 2 of us! ), where I learned a lot about a little known architectural specialty involving signage and wayfinding design. By the time Brad (our oldest son) was born, I had struck out on my own and Gary joined me just prior to that life changing event. 30-something years later, that's still our "city job", but we truly hope to move into full time ranching soon. Since 2003, we've been delving into every aspect of sustainable ranching, trying to grow delicious, nutritious beef and designing our last home to be built at the ranch, where we now live - in yet another, and hopefully our LAST, tear-down worthy dwelling. A: Gary grew up in Wichita Falls, about 40 miles southwest of here. He and his dad drove up to the ranch several times a week to do ranch work and check on the cows, but they never lived here full time. Nevertheless, ranch life was as deeply embedded in his psyche as city life is in mine. When his dad passed away, Gary dutifully obeyed his dad's wishes.. he sold the cows and leased out the land - to us! We were ranchers, like it or not, but I think he always hoped to return to his roots. Despite being familiar with ranch workings, raising cattle and the business side of making it profitable were not part of our experience, so there was a very steep learning curve ahead of us. They say you make your biggest strides forward from your biggest mistakes and that has proven itself true over and over for us. Along the way, we've made great friends, found knowledgeable colleagues and feel like we're on the right track. ALWAYS learning, always experimenting, always striving to understand more and more about the abundance of life in the soil and it's foundation for all that we do to raise the best food we can. Q: What is the difference between grassfed beef and the stuff you find in the grocery store? All of our calves are bred and born on our ranch. They eat only pasture forage, which in winter or cases of drought, can include high quality hay we either grow ourselves or buy from another trusted farmer. We treat them in a very gentle, respectful way - no prods, no ropes, no confinement, no "rodeoing". They respond to us easily and truly live a very stressless life here on the ranch. We only harvest when animals reach the fullest potential we believe they can. Their meat is filled with great nutrition and nothing else. 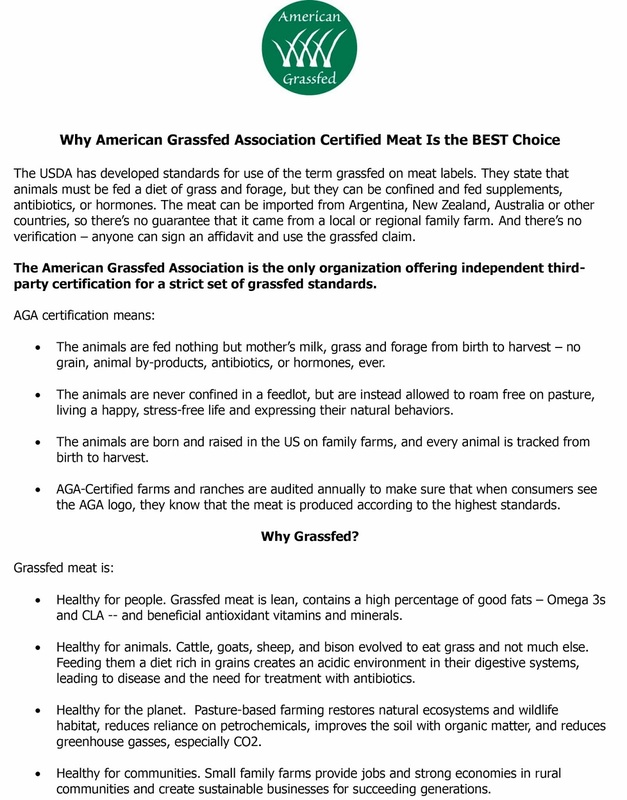 Below is an excellent explanation of the differences in [certified] grassfed beef from AGA. In addition, even our processor must be Animal Welfare Approved for their handling and slaughter practices, ensuring that our animals remain as stress free as possible at all stages. Q: Why is it important to know your farmer/rancher? A: Labels are about as confusing as they can possibly be. The USDA says it means this, the package says it means that; "natural" as a labeled quality means virtually nothing. It's almost as if words are used to make consumers feel good about what they buy, but really have little substance to back what you think that means. And sometimes labels are just plain deceptive as in "no hormones added" when that species is not allowed by law to have hormones added anyway. It makes the brand that uses the terminology look better than the brand that doesn't, but they're both essentially the same product. Companies will get away with what they can get away with, in many cases. There are a lot of ways to ranch and farm. Like the labeling issue above, one rancher might say their product is grassfed, when what they really mean is, that animal ate grass until they put him in a tiny pen at about 700 lbs and fed him GMO grain til he got nice and fat. So it really is important to know who raises your food, talk to them and understand exactly what they mean by what their methodologies and protocols are. Do they use chemicals, if so, what kind and what for, do they vaccinate, at what age and what for, do they use hormones in any form, fly tags, how about feed additives like grain-based cattle cubes, what is their grazing philosophy, how big are the animals when they are harvested, how do they know an animal is "finished"? If you take the time to ask the questions, visit the ranch or farm, see how the rancher handles their animals, you'll know whether or not you can trust them to raise high quality, honest and pure meat. If you don't know what to ask, the American Grassfed Association and Animal Welfare Approved both have excellent websites that can give you some consumer friendly guidance on what the "gold standard" of pasture based ranching really is. Both of those organizations conduct yearly audits and require detailed records from participating ranches to achieve and maintain their certifications' statuses. Look for and ask about a rancher's or farmer's certifications and what they mean. They may simply know they're doing the right things and feel they don't need certifications to prove it, or possibly they know they would not meet the requirements. Either way, consumers should ask. A: Depending on conditions completely outside our control to grow the pasture forages our cattle need and learning to effectively manage the conditions we can at least influence. We can't make it rain, but we can develop pasture management and grazing practices that optimize soil health and moisture retention. We know we'll still be learning til the day we die. A: Oh, so many good things! Life in the country is so different than Dallas, but so peaceful and worship-full. I think what floats my boat the most is learning day by day about the wonder of God's creation.. to the most minute detail imaginable - soil structure and microbes - and how they form the base for sustainability of all land life. I never knew that the beef or chicken or vegetables I ate have that much of a vital connection to what's below the ground, hiding down there, invisible to us. But it's critical. If you strip the land of it's life, all you can do is add ever increasing amounts of chemicals to artificially grow nutrient-starved food. (I might be a bit of a biology nerd...). But the times I get to spend interacting with the people who eat what we grow, or just want to learn about how we grow it, are pretty special, too. Q: Do you have any advice for someone like me, who wants to do everything they can to live a healthy, sustainable lifestyle? A: (Lots of random thoughts as they've come to me. No particular order...) Read, read, read! Be a critical thinker. Look for products that are as free of processing as possible (the middle aisles of typical grocery stores are where most of the processed stuff hangs out, but the meat, dairy and bread areas are chock full as well). Read articles, read labels, read & subscribe to blogs about sustainable living. Be aware that deception does take place so be discerning. Buy directly from a trusted farmer or rancher. Buy local if you can and from stores who carefully do their homework and source reliable products, like Urban Acres, whenever possible. Stay away from GMOs - look for the Non GMO Verified seal on packages. There's a huge movement to government-mandate labeling of GMO containing products, but so far, the voluntary no GMO seal is what we've got to go on and I applaud the companies who have opted in. Cook from scratch as much as you can and if you don't have much time to cook, eat as much raw food as you can instead. Grow SOMETHING you can eat! Even if it's a pot of basil in the kitchen window, it's a start & one less thing you have to go out and buy from who knows where. Teach your kids to grow things. Exercise, move, walk, and teach your kids to do the same by example. Know that it's almost impossible to get it all right (whatever that means....) and don't stress when you have to cut a corner. Eat out less, be outdoors more. Join a CSA or a food coop. Most of all, if you want to make sure there's a steady supply of farmers and ranchers who raise food in a sustainable way, buy their products!!! Support them. It's hard going against the grain (ha! literally!). Big Ag and Big Phama are ENORMOUS forces to reckon with, extremely powerful, and highly involved in all levels of government and agricultural "research", and we're the ones out there, tiny as we growers are, educating some of the most "learned" agricultural scientists in this country about what this all means. We NEED your support! A: We are so grateful to be ranching and absolutely love the wonder of being able to work with nature - inside of God's awesome design of this earth, not fighting it with chemicals and additives. Sustainability is the very result of this guiding principle. Their beef is sold around Dallas as well - in many Whole Foods locations as well as at Urban Acres Farmstead in Oak Cliff. Thank you, Lauren, for such valuable information! Loved this article and the perspective you give on a farmer's life and what it truly takes to go outside the grain. Thanks!